Unplug the refrigerator and pull everything outta the freezer, and I mean everything. Then, remove the bottom panel inside the freezer so you can see the condensate trough in the back of the freezer as shown here, click it for a larger view. Notice that the condensate trough is filled with ice– all that has to be cleared out. Take it easy back there, delicate parts are exposed– don’t start hacking at it with an ice pick because chances are you’ll just end up puncturing the evaporator and you’ll turn a simple, inexpensive repair into a majorly expensive one. 1. Come git you a defrost drain strap. 2. Install according to the supplied directions. 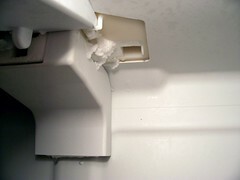 This entry was posted in Refrigerator Repair on July 10, 2006 by Samurai Appliance Repair Man.